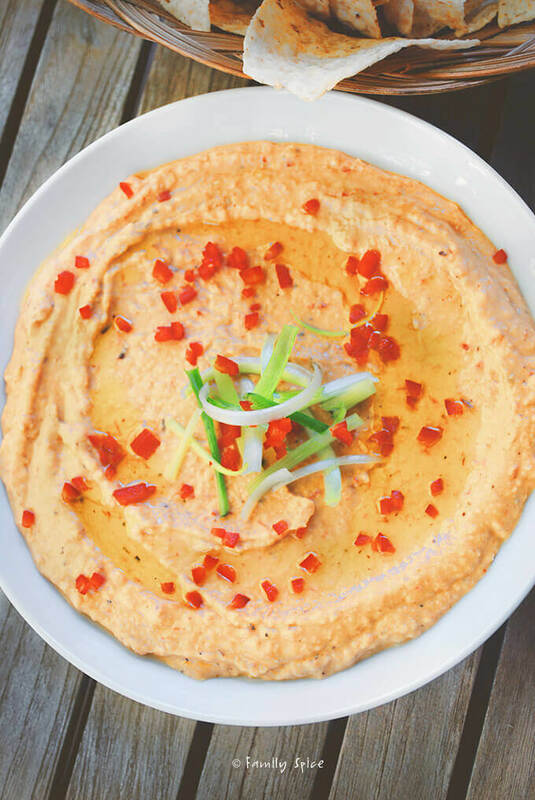 Roasting your sweet red bell peppers enhances their flavor and adds smokiness to this delicious Roasted Red Pepper Hummus. Fall is here and that means football season has started! If you don’t have a team to cheer on or can’t stand watching overpaid athletes chase a ball, have no fear. Tailgating parties means it’s all about the football munchies. And boy do I have some of my favorites bites to share with you! If I could forgo a big meal and just enjoy appetizers, I totally would. The Spanish knew what they were doing when they developed tapas as a way to eat. Small bites of different types of dishes, so many flavor options and textures, too. TOTAL YUM! I also go weak in the knees for chips and dip. Cheesy dips, artichoke dips, veggie dips, hummus dips. Man, I love them all. Then there’s the vessel for the dip: tortilla chips, potato chips, pita chips, celery, carrots…. oh, goodness, I’m getting hungry! 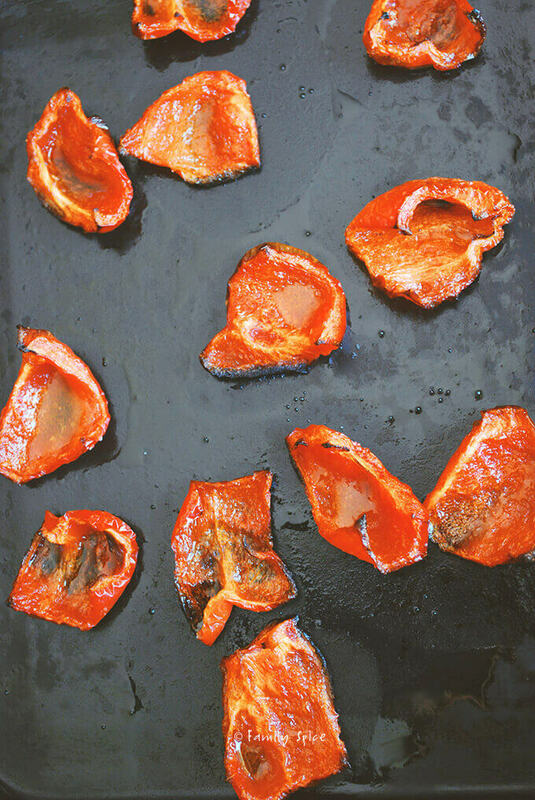 There is something special about roasting bell peppers. They turn smoky and sweet and are delicious in salads, as a condiment, or event in sauces and yes, dips! 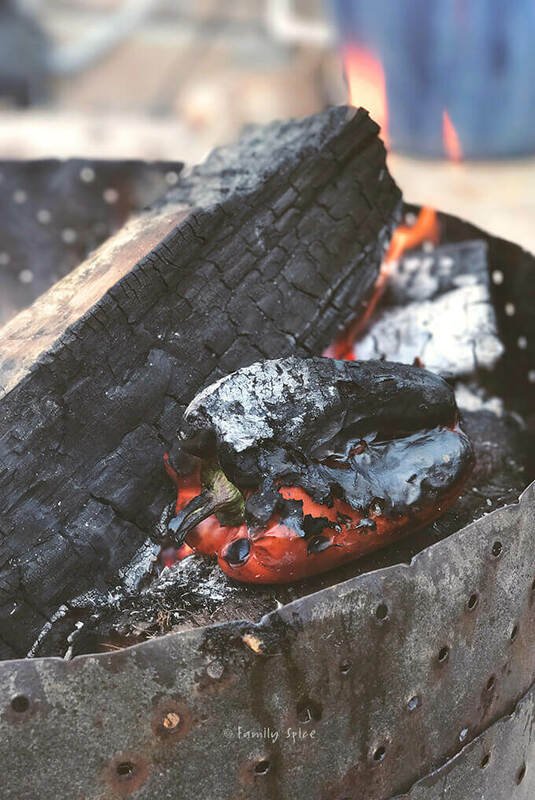 And today I am sharing what a roasted red pepper hummus that truly highlights the beauty of the roasted pepper. Don’t have fire? 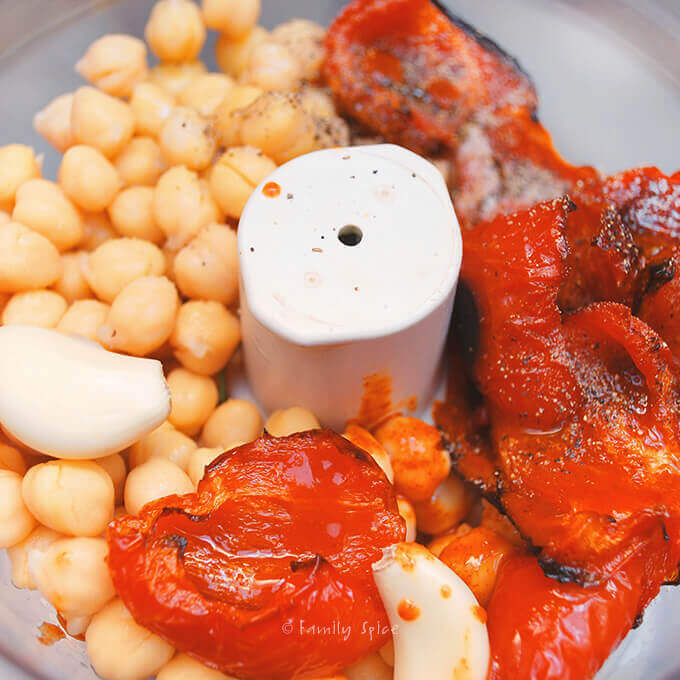 you can roast the red pepper in the oven. It works just as well, but is admittedly, less smoky. 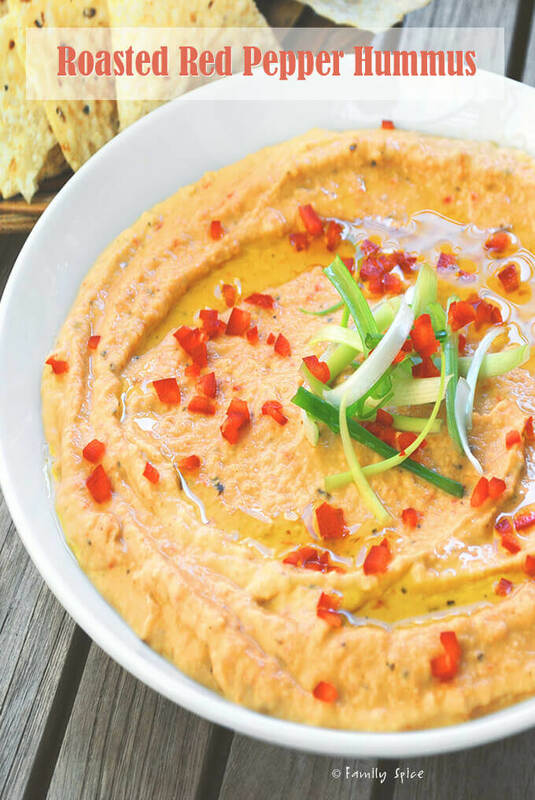 Toss the roasted peppers (minus any charred skin and seeds) in the food process with the rest of the hummus ingredients and you have a quick, easy, and super delicious dip for your chip to swirl in. Need some more of my favorite dip recipes? 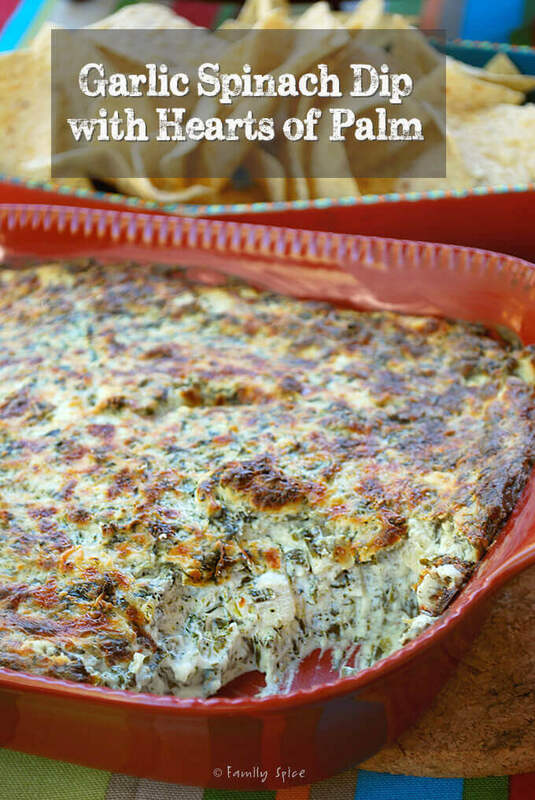 If you are a fan of the artichoke dip, then you’ve GOT to try this Garlic Spinach Dip with Hearts of Palm. My pickle-loving-kids positively adore hearts of palm, so featuring in a cheesy dip just escalated the love to a whole new level. Click here for the full recipe. 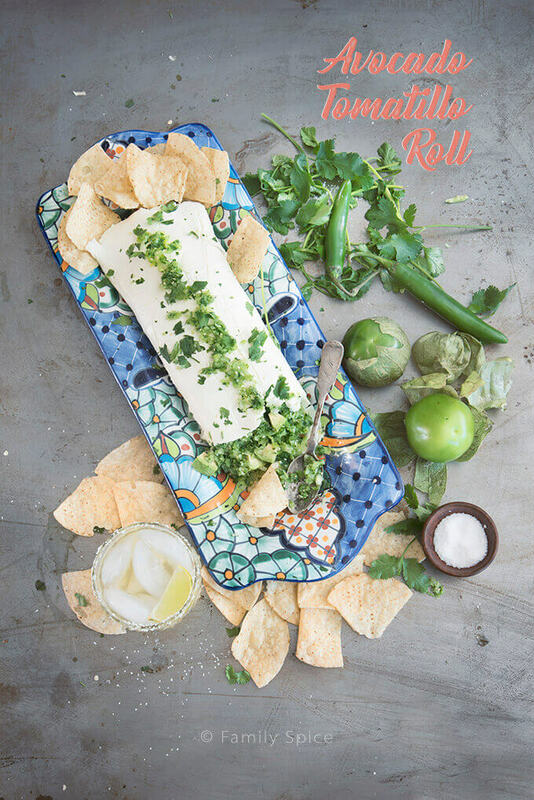 This Avocado Tomatillo Roll is not your usual dip. Avocados are mixed with tomatillos, cilantro and serrano chiles and then wrapped around a blanket of cream cheese. The flavors are… WOW! And your guests will totally get wowed by party happening in their mouth! Click here for the full recipe. Okay, this Hatch Chile Corn Dip is crazy addictive! This is another one of those dips that your guests will lick the bowl clean. 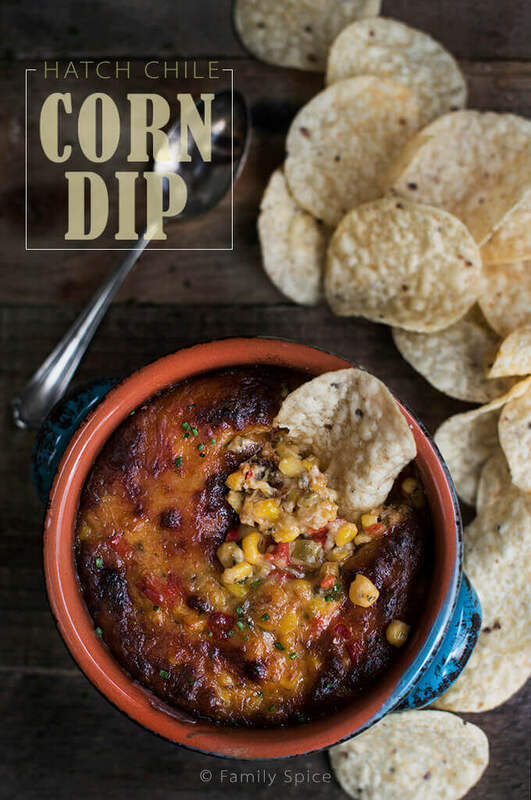 I get special requests to make this dip, so you’ve GOT to try it! Click here for the recipe. And the last special dip I want to share with you is another favorite of mine. I know, I say that a lot, but I did warn you about my love for dips! 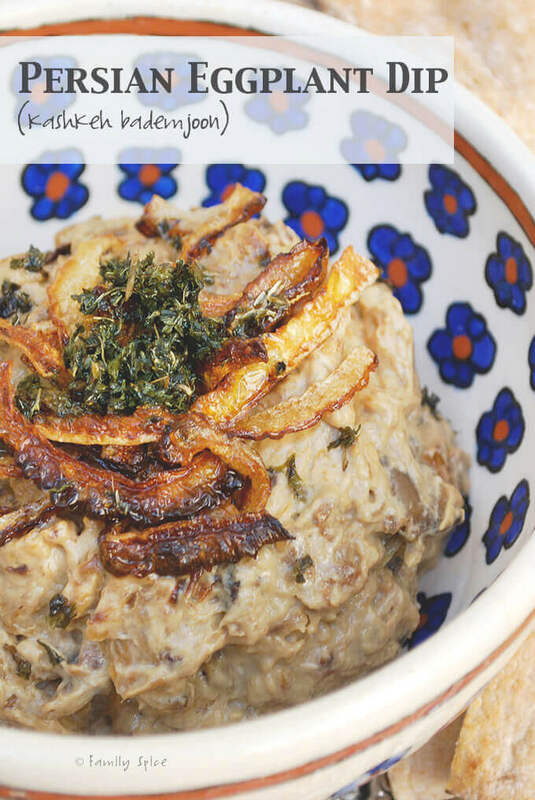 This Persian Eggplant Dip is similar to the Arabic Babaganoush, which is made with tahini. The Persian version is eggplant, onions, garlic mixed with kashk, which is drained and dried yogurt. It is sour. You can also use sour cream, which is more mild in flavor. Seasoned with mint, served with chips or lavash, and this dip will blow you away. Click here for the recipe. Whichever one of these dips you choose, you will find yourself a winner. So which one will you try first?! Roasting your sweet red bell peppers enhances their flavor and adds smokiness to this delicious Roasted Pepper Hummus. Place on a roasting pan and cook for 30 minutes, or until browned. Remove from the oven and allow peppers to cool 10 minutes. 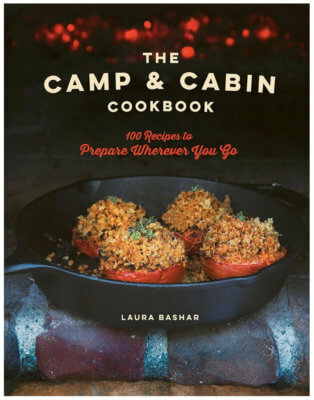 You can also roast your peppers over a gas burner or outside in a grill. Finely chop about 1 tsp of bell pepper and reserve for garnish.